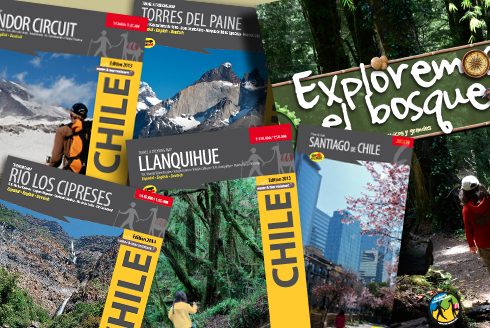 In collaboration with the foundation Trekkingchile we offer a great selection of travel guides and maps, which you can already order online before your trip or purchase directly in the ContactChile office-shop in Santiago. The best and most up-to-date road maps of Chile have been edited by the Chilean publisher Compass under the label of the gas company Copec. They cover the whole of Chile in 9 sheets at a scale of 1: 400,000 and attract because of their design, the road network is updated annually and they are printed on tear- and water-resistant material (Stone Paper). Detailed travel and trekking maps of major tourist destinations and national parks are available in excellent quality under the label Trekkingchile, among others for San Pedro de Atacama, Pucón-Villarrica, Llanquihue and Torres del Paine. All maps mentioned here can be purchased via the website of Trekkingchile. We generally advise against the navigation devices offered by rental car companies. Their maps don't have the same quality as usual in other parts of the world and the devices themselves are not cheap to rent. If you want to use a navigation device, better bring your own and get the suitable maps for Chile and Argentina beforehand. A better way is to use a chilean prepaid chip for your smartphone, buy data volume and navigate with an app as Waze, ioverlander, Sygic, Galileo or Google Maps.